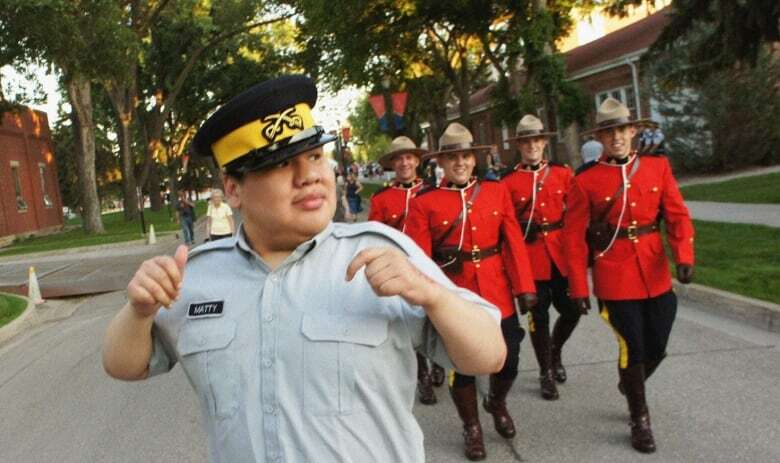 Matthew Brandon holds a special place at the Depot, as the RCMP training academy in Regina is known. The 25-year-old, who has the mental capacity of a toddler, has been named an honorary drill unit member. 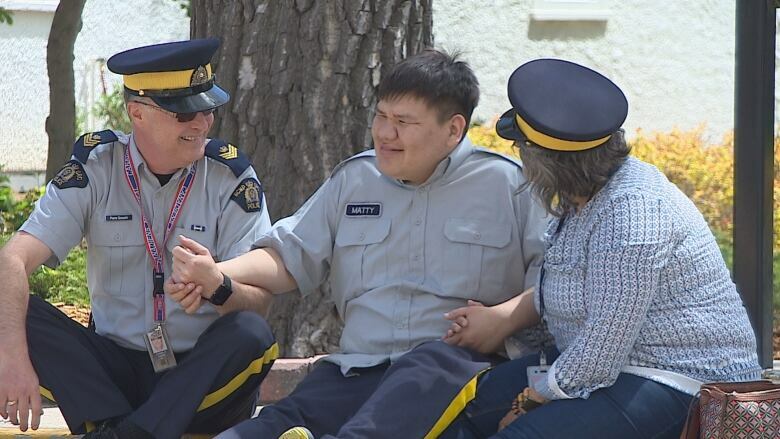 Matthew Brandon, 25, may have the cognitive skills of a three-year old and is unable to speak, but his adoration for the RCMP is clear. Their devotion to "Matty" is just as obvious. 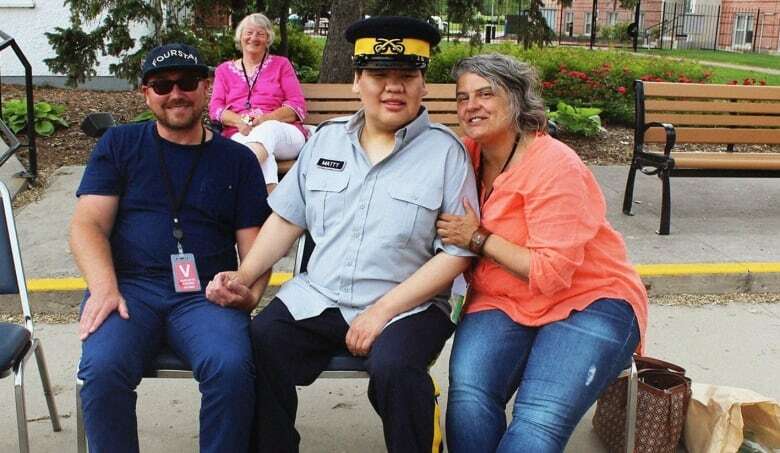 Every Tuesday for the past four and a half years, Brandon's guardians have taken him to watch the Sergeant Major's Parade at the RCMP training academy in Regina, known as the Depot. The young Indigenous man has autism, cerebral palsy and fetal alcohol syndrome. He smiles, grunts and stomps his feet as cadets march in military-like formation for roll call and inspection. Most of all, he loves the brass band. He clutches his iPad and records the band, then watches the videos over and over. "It's on repeat. He wakes up to it and goes to bed pretty much watching RCMP parade," said his caregiver, Shannon Gardiner. Brandon proudly sports his own grey and navy cadet uniform with the name tag "Matty" on it. It was given to him on his 25th birthday, when he was named an "honorary drill member." "He's part of the family," Cpl. Nathan Olson said. "It's hard to have a bad day when Matty is around — he's so full of joy and happiness when he's here." The Sergeant Major's Parade dates back to 1874 and remains a strictly regimented training exercise for RCMP cadets. Yet on Tuesdays, if you watch closely, you can see officers bend the rules for just a moment as they sneak Brandon smiles and waves. Then, at the end, the drill commander takes Brandon's hand and escorts him in the parade. He's the only member of the public to be allowed to accompany the band following parade. "Sometimes, you might have to twist out of the rigid rules of drill and just make him happy. That's what we want to do, is make him happy," said Sgt. Pierre Gosselin, a former drill unit commander. 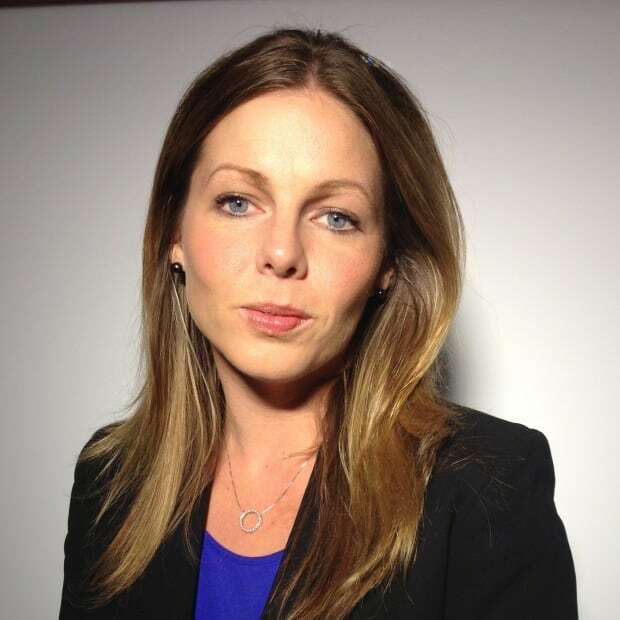 Brandon's caregivers, Chris and Shannon Gardiner, are grateful and a little amazed that the RCMP leadership has shown such flexibility within their rigorous protocols. "This being one of the most rule-based places in Canada, Matty's just allowed to kind of break all those rules," Chris Gardiner said, shaking his head. It all began in 2012. At 21, Matty was aging out of the foster system. The Gardiners, who had cared for him since he was six, were reluctant to place him in a government-funded care home. Brandon's future was uncertain. At 220 lbs., but with the cognitive skills of a three-year-old, Brandon would become aggravated and at times violent. The Gardiners insisted on keeping him at home and began the difficult process of negotiating funding from social services. 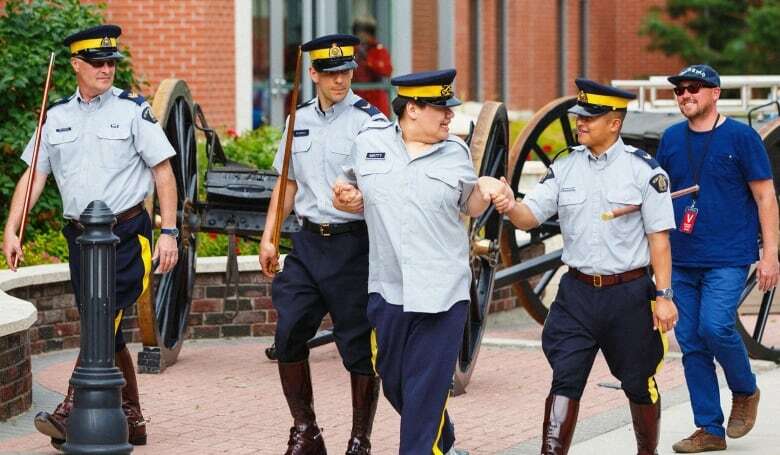 To pinch pennies, they were looking for free entertainment to keep him busy and sought it out at the RCMP heritage centre and drill parade. After just one visit, Brandon was obsessed. He loved it so much, the Gardiners took him back the next week. And the next. And the next. His caregivers say that as long as he maintains a consistent routine, he doesn't have violent episodes or hysterics. Over time, a friendship evolved with senior officers — Brandon's enthusiasm is too contagious to resist. Cpl. Olson looks forward to Tuesday as "Matty's Day" and waits for that moment when Brandon will rush to his side. "It took a long time. Matty would just go to the females, most of the time, in uniform, and there was [distrust] with the men," Olson explained, "But eventually he did come to me after about six months, so that was a huge day for me when he eventually came and grabbed for my hand." Sgt. Pierre Gosselin has been a RCMP officer for 35 years. He spent the first 22 policing in the community before moving into training roles at Depot. He said he misses interacting with people. Every Tuesday, he takes time to find Brandon and sit on the sidelines with him. "Matty smiles and he grabs my hand," Gosselin said, with his own smile. "He's like my little brother." 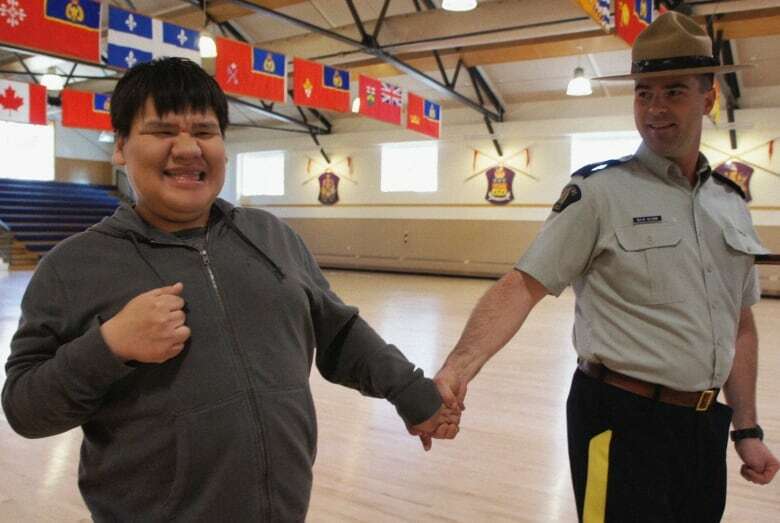 As a trainer, Gosselin understands that for some cadets, meeting Matty is their first opportunity to interact with a person with an intellectual disability. Gosselin expects it will help them become better police officers in the future. A thousand cadets go through the training academy every year, so Brandon's story has trickled through the ranks. 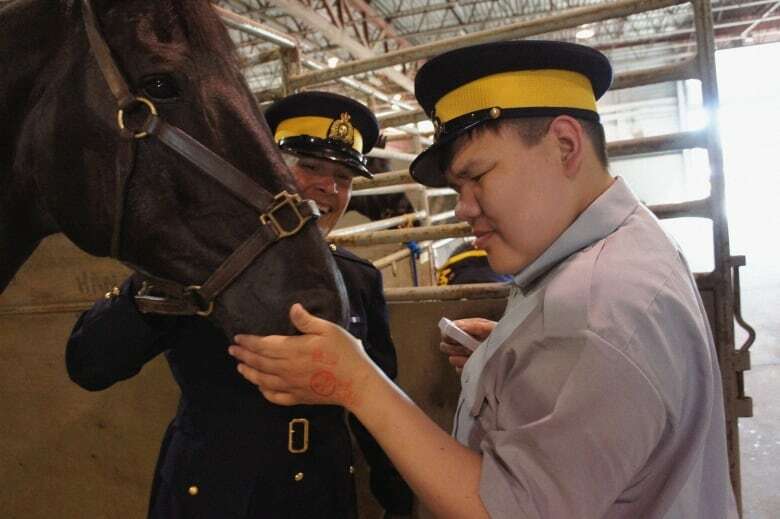 So much so, that when the RCMP Musical Ride announced it would launch its 2017 season in Regina, Brandon received a special invitation from Ottawa to attend. His caregivers decided that the night-time event would be too overwhelming for Brandon but were eager for Sgt. Scott Williamson to give him a private tour with the horses. The Gardiners try to strike a balance between sticking to Brandon's strict routine and introducing him to new experiences, a struggle they describe in a Facebook page dedicated to his life. But "Mr. Smiles" – his nickname – seemed impressed and tentatively petted a horse. Even when things go awry, the Gardiners are comforted by the fact that Brandon will be welcomed back at his "happy place," as Shannon Gardiner calls the Sergeant Major's Parade, the next Tuesday. Police find missing Regina teen in Meadow Lake, Sask.